Cat & Cauldron is heading into winter with some fresh stock and a warm welcome! New Pagan/Esoteric Jewellery and pendants now being added. TAROT READINGS and spellwork always by email consultation - if you want a reading in person - ADVANCED APPOINTMENT ONLY PLEASE - Liz is not always in town! Herbal Supplies - largest range in Europe - quality raw herbs, ESSENTIAL OILS and Tinctures. Now adding powders and glycerites. CLOTHES - Robes & cloaks in stock in many colours, and a fast made to order service. A small range of medieval dresses and Pirate shirts. BOOKS - old and new - Top class Occult and obscure esoteric titles and magazine back-numbers. Also Ghost books, Sci-Fi 1st Eds and much more. 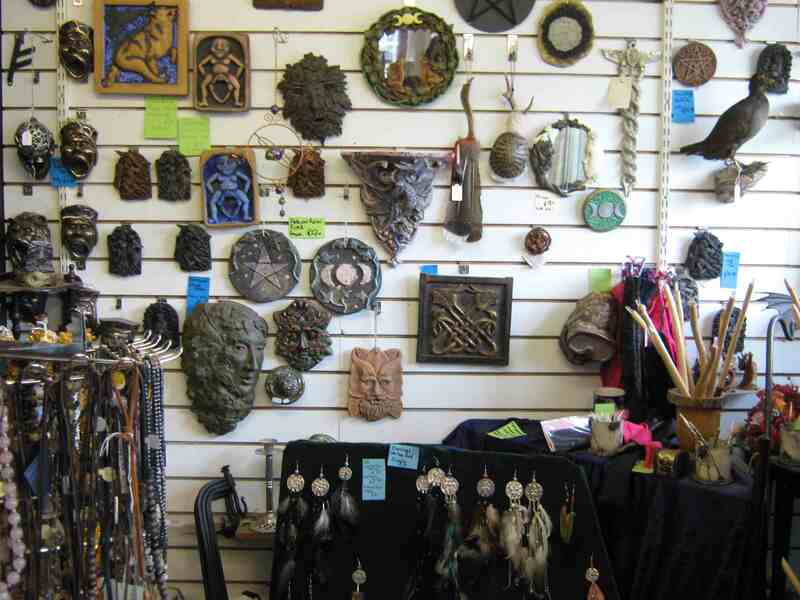 UK-made pagan items, artwork, including pyrographed and painted wooden altar plaques, staffs, runes, wands, and turned bowls & chalices. Also a full range of athames & bolines. A wide range of taxidermy, antiques and curios which tend not to make it to the website - Email for current list or pictures! whatever your Pagan path - HAIL & WELCOME! Please note we do NOT have a phone number because we are generally dealing with shop customers. WHOLESALE - We offer a limited wholesale service on all our herbs & oils, and a few of our in-house product ranges. Witchcraft Shop (est. 2003), maintains a vibrant and very different retail emporium at the Cat & Cauldron, in the centre of Glastonbury, the heart of magical Avalon. Magical practitioners, occultists, bibliophiles and curio collectors ourselves, we are dedicated to supplying only the finest quality goods, old and new, to the Pagan & esoteric community. For your HANDFASTING, Baby Naming, Pagan Funerals or indeed any Pagan Blessing ceremony. Services range from simply conducting the ceremony to full event managment and of course supplies - contact us for details. PERSONAL VISITS - always welcome, but be aware that increasingly one or other of us is out of town on other projects these days - so please WARN US WELL IN ADVANCE.